Sometimes words get in the way. For example, take the phrase "Coefficient of Friction". It sounds like a mathematician's or physicist's phrase that couldn't possibly be something you either need to know or that you might have interest in. But "Traction" is obviously important to you. They mean essentially the same thing, though traction is a function of weight. When two objects press against each other, it takes a force to cause them to slide against each other. And once they begin to slide, it takes a smaller force to keep them sliding. "Coefficient" merely means "relative to" or "as a percentage of". If you placed a part of a rubber tire along with a weight (say, a total of 100 lbs.) onto a concrete roadway and pulled it with a scale that measures how much force you are using, then if it took 90 lbs. of force to cause that object to begin to slide, it would mean that the Coefficient of Friction between those two surfaces was 0.9, or 90%. That is, it takes 90% of the weight of that object as a force to cause it to move. That's also known as its 'Rolling or Static Coefficient of Friction". It does not matter if the object weighed 100 lbs. or 1,000 lbs., the same rubber object on the same concrete surface would start to slide when 90% of its weight was used to try to move it. In other words, whether it was a school bus or a motorcycle, it still would take 90% of its weight as a force to make it begin to slide on the roadway. Once it begins to slide, it only takes a force that is about 80% of that required to start the slide to keep it sliding. So, if it took 90 lbs. to start the slide, it would take only about 72 lbs. to keep it sliding. That is the other "Coefficient of Friction" and its called the "Sliding or Dynamic Coefficient of Friction". Gravity is an acceleration. Near the surface of the earth, you have 1.0 gravities (or, 1.0g's for short). At 1.0g's, your motorcycle with you on it weighs something like 700 lbs. On the surface shown it would take 1.1 times that weight (770 lbs.) as an acceleration or deceleration force to cause it to slide and it would take 0.825 times that weight (577.5 lbs.) to keep it sliding. 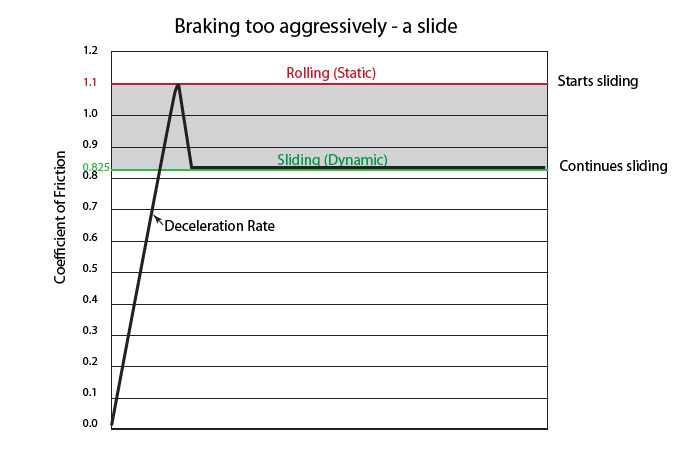 Notice how convenient it is to have friction expressed as a percentage of gravity or weight since we can now also say that it takes a deceleration or acceleration rate of 1.1g's to cause a slide to start and that once the slide begins, the bike will than have only a deceleration or acceleration rate of 0.825g's. That shaded area is very important. If you can slow your bike at a rate anywhere within that area, without touching the top of it, it is not sliding and it is slowing at a rate greater than it would if it was sliding. 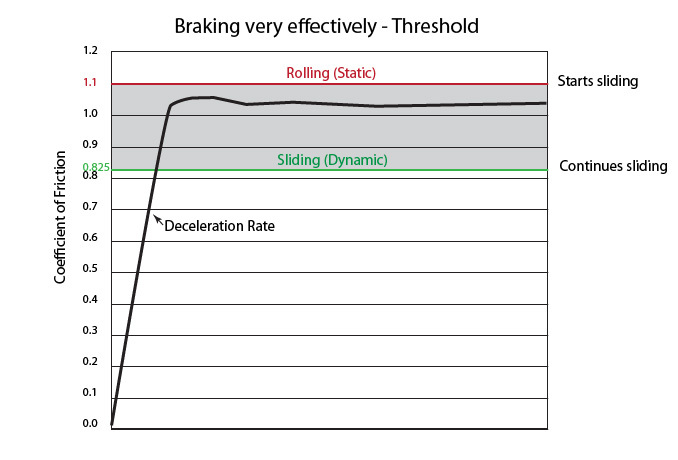 It would, in other words, be stopping at a rate I call Threshold Braking. Within a reasonably large (very) range of weight, the CofF does not change. It is for that reason that a school bus or a motorcycle will slide at approximately the same deceleration rate (assuming the tire rubber is the same - a high mileage tire is a little 'harder' than normal tires and has a slightly lower CofF.) Obviously that means that a touring bike or a sport bike, regardless of weight, will also skid or slide at the same rate - again, assuming the same tire rubber. Traction, of course, does change as weight changes. As weight increases, traction increases, but the CofF does not. 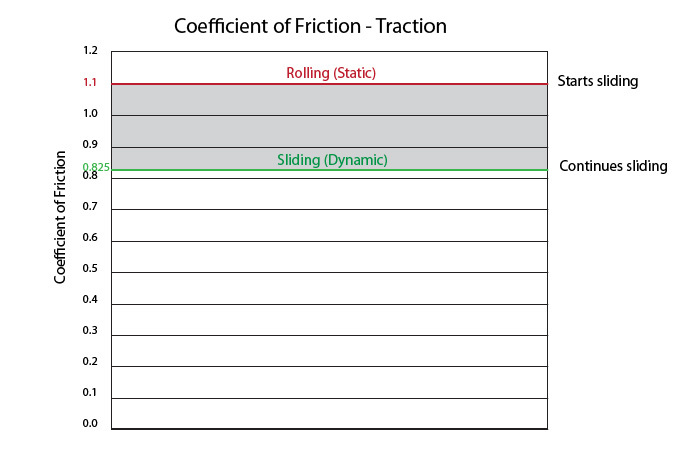 When I said they are the same thing, I meant conceptually - they are both measures of resistance to skid or slide, with traction being a function of weight and CofF not being a function of weight (other than its existence). Copyright ? 1992 - 2019 by The Master Strategy Group, all rights reserved.